Line Stripers - Northwest Spray & Compressor, Inc.
Click "Line Striper Comparison Guide"
The most versatile airless line striper on the market! 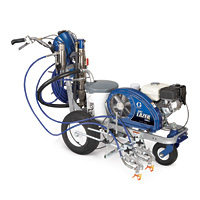 The LineLazer IV 3900 is the preferred choice for both pavement and turf applications. The LineLazer IV 5900 is the clear leader for 2-gun professional stripers and are designed specifically to deliver the most precise and consistent lines in the industry. 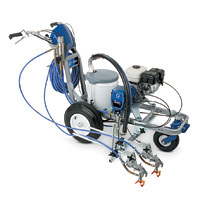 The clear choice for high production striping needs! The LineLazer IV 200HS is the solution for medium to large jobs that demand line perfection - everytime! The PowrLiner 1800M is a simplified, lower GMM version of the PowrLinr 2800M that is perfect for entry level contractors who need a line striper for smaller jobs on pavement, fields or turf. 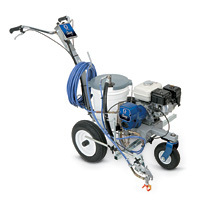 The PowrLiner 2800M has greater paint output, a slower cycle rate and a cart configuration that is compact and highly maneuverable. It is ideal for smaller and medium projects. Recommended for Medium to Large-Scale Projects on Airports, Roads, Parking Lots and Athletic Fields. 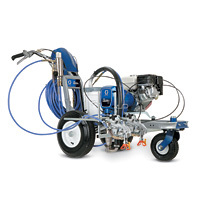 Recommended for Large-Scale Projects on Airports, Roads, Parking Lots and Athletic Fields.